Welcome to the SodaStream Review and Giveaway! 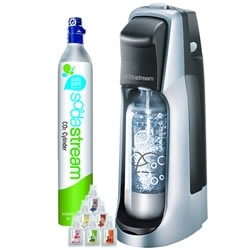 SodaStream is a fabulous alternative to buying soda and pop. Make your own! Save a bunch of cash and enjoy making your own with their large variety of flavors. Plus, it is a lot of fun for your kids! Check out our SodaStream Flavors and Machine review we done a while back. We really enjoyed it! Read the entire SodaStream Review on My Four Littles. One lucky winner will win a SodaStream Fountain Jet Machine! Please enter using the Giveaway Tool below. we wanna try ALL teh sodas! I’d like to try the diet lime cola! Always wanted to try a Soda Stream. Cream Soda all the way! cream soda, I used to love that flavor and haven’t had it in years. I’d like to try the regular cola. Thanks for the chance. I would love to try the ginger ale and pink grapefruit from the Sparkling Naturals line. cream soda would be my first try but I’m gonna drink gallons of diet everything. I would love to try the all natural ginger ale. Thanks for having this contest.